They're burying George HW Bush today and even before they planted him, the whitewashing began: we've heard an awful lot about how kind he was to his service dog and his love of colorful socks and a lot less about his role in running an onshore terrorist training camp for Latin America's death squads, his role in toppling democratic governments on two continents, his role in arming and supporting Saddam Hussein, then turning on him and kicking off a genocidal war in Iraq whose goal was to bomb an advanced, heavily populated nation "to the pre-industrial era." 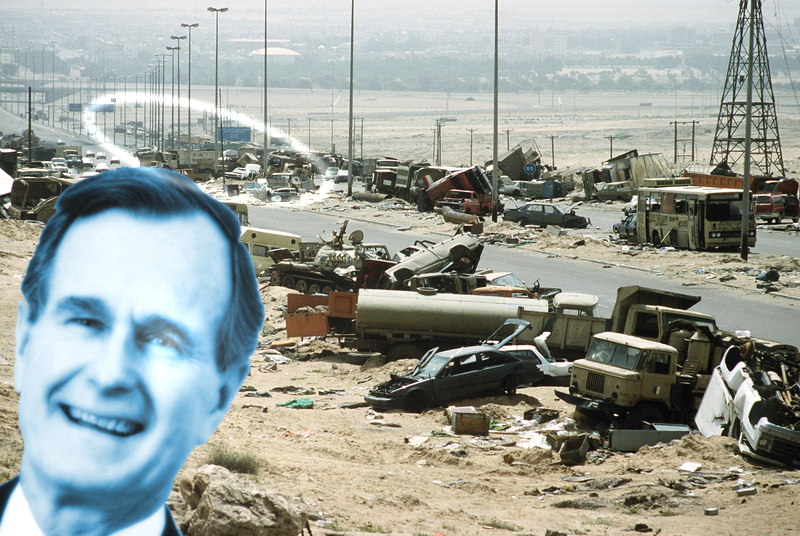 As Jeremy Scahill (previously) puts it in this week's Intercepted podcast (an 84-minute documentary on the humanitarian legacy of Bush I): the US state religion is American Exceptionalism, and today they will saint George Herbert Walker Bush. The Bush family are not your friends, not even when they're cuddling with Michelle Obama. They are the scions of war profiteers whose fortune grew through helping the Nazis tool up during Hitler's rise to power. They are war-mongers themselves. They have deliberately and coldly planned the murder of civilians: babies, children, women, the elderly. They killed, and the policies they created were carried on and the antes murderously upped by Clinton, by Obama. Rest in Peace, St Bush, and may your millions of victims find you in the afterlife. The United States is now in the midst of a grotesque canonization of one of its imperial saints, George Herbert Walker Bush. This week on Intercepted: an honest memorial service for an unrepentant warmonger who dedicated his life to militarism, war, coups, regime change, and the lies of “American exceptionalism.” Jeremy Scahill details the crimes of Bush, the sick propaganda of the corporate media memorials, and the trail of blood, death, and tears Bush leaves behind. Independent journalist Arun Gupta covers decades of Bush, from his time at the helm of the CIA to the presidency. Gupta discusses Bush’s support for Manuel Noriega and his eventual invasion of Panama, the pardoning of Iran-Contra criminals, the dirty wars in Central America, the support for Saddam Hussein, and the launch of the Gulf War. Acclaimed Iraqi poet and scholar Sinan Antoon describes his life under the U.S.-backed dictatorship of Saddam, the horrors of the Gulf War, and how Bush’s destruction of Iraqi civilian society led to the rise of ISIS.